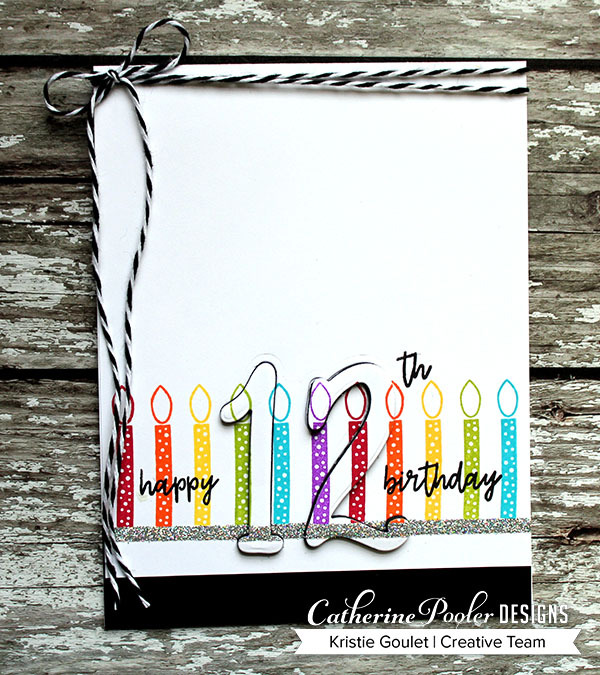 Kreative Kristie: HAPPY 12TH BIRTHDAY & STAMP OF APPROVAL SNEAK!!! Hi everyone! 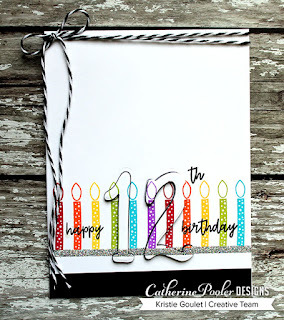 I'm back today sharing another birthday card using some new goodies from Catherine Pooler. I stamped the fun candles in rainbow colors across my card panel. I added a strip of double sided tape across the bottom of the candles & added some silver glitter. I then die cut the number 12 using the Milestone Birthday Numbers dies from the panel and also from some black fun foam. I adhered them together to create dimension and to help the numbers pop off the page. I stamped the sentiment onto the panel and adhered it to my card base. I added a small strip of black card stock to the bottom of my card and some black and white twine to finish it off. Before you go I wanted to share a sneak peek of one of my cards for Catherine's next Stamp of Approval Collection coming out January 9th! Make sure you come back on Monday for the Blog Hop. I have lots more to share with you! This collection is amazing!!! Kristie, when did you stamp on the numbers that are raised to match the original layer? Oooh, awesome card! Great sneak peek, too! Sweet hidden 12th cut, but your wreath is stunning with that pop of teal! Very effective! Love the rainbow colors and how you added the number to the candles.